The performer is visibly locked into an examined metal boiler, which is then filled with boiling water! The performer claims he will be able to survive the scalding waters because of his psychic powers. The level of the water is seen rising on the indicators and the temperature is recorded on the boiler's thermometer. The boiler has no visible doors and can be examined, both inside and out. Any other person locked inside the boiler would be unable to escape from it. The temperature shown on the boiler's thermometer is the ACTUAL temperature of the boiling water. The rising level of the water, as the boiler is filled, can be seen both on the water level tube and by opening the water spigots. As the water rises, it will leak out of the opened water spigots, one at a time. When the water level reaches the first spigot and starts to leak, the assistant closes that spigot. As the water rises to the second spigot, it will leak out of it until the assistant again closes the second spigot, etc. To prevent drowning, the assistant tells the audience that the psychic performer will attempt to dematerialize his body and to materialize outside of the boiler. A curtained cabinet is placed around the boiler, and a few moments later a brilliant flash of light is seen to come from inside the cabinet. Immediately the performer steps forward. HE IS COMPLETELY DRY…and unharmed, even though moments earlier he was doused with scalding water! The performer explains to the audience that the heat generated by the process of dematerialization completely dried him. The cabinet is removed and the boiler is still securely locked. The boiler is a cylindrical metal boiler similar to the type used for heating water. It has a removable top, but the top is not gimmicked in any way and can be inspected by anyone. It has a solid metal bottom. It is built of stainless steel. 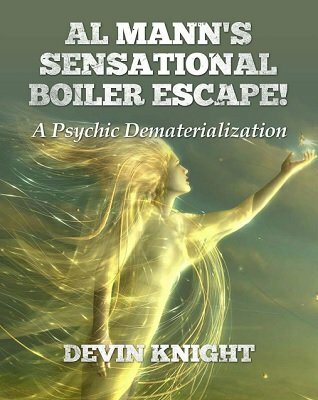 The boiler looks escape-proof and is escape-proof to anyone except the psychic performer! This new book by Devin Knight discusses the close friendship that he shared with Mann. It also gives the full story of how Mann offered him the exclusive rights to perform this and how the original manuscript was pulled off the market. Mann's original directions, drawings and plans are included in this release. The buyer is given full permission to construct this illusion and performance rights, except for national television. The performance script developed by Devin Knight and Al Mann is also included in this release. This is one of the most unusual psychic feats ever developed by Al Mann. Imagine a performer getting into a small boiler that is then filled with boiling water, and not only surviving being severely burn, but miraculously dematerializing through the boiler and appearing on the outside completely dry moments later. One of the most baffling feats ever conceived. A must read for Al Mann fans, collectors wanting a copy of an impossible to find Mann release, and those looking to add an unusual death-defying illusion to their acts. PLEASE NOTE THIS ILLUSION IS COMPLETELY SAFE. AT NO TIME IS THE PERFORMER IN ANY DANGER OF BEING SCALDED ALIVE OR DROWNING. THE METHOD IS INGENIOUS AND TYPICAL AL MANN THINKING. 1st edition 2013, 19 pages.